How do you get people to value and use their Gold Cards, and not just leave them in their top bureau drawers? So many people are issuing them these days that they have become as common as diskettes. The novelty is gone. For a while, they were a valued and treasured item, unattainable by the ordinary customer — only available to the best buyers with the highest credit rating. Then, as always, the dam burst, and hundreds of companies began issuing them to everyone in sight. Another relationship-building bonus destroyed. That seems to be that. But, hold on there partner, that is not necessarily that. There are still some companies that have not devalued their gold cards, and are still doing well with them. American Airlines Advantage Gold is one survivor that is worth discussing. I have told the story of how I got my AA gold card so often that almost everyone knows it, but it is worth repeating here. To get an AA Gold card, you have to have flown 25,000 miles in a single calendar year. On January 1 of each year, the clock starts running again, and you lose all the gold qualifying points that you built up the previous year. I have been accumulating American Airlines miles for the past ten years, but I had never made gold. Last year, I came close. I called American Airlines on Christmas to ask how many gold qualifying miles I had built up. So, for $44, I bought a round trip ticket from Washington to Raleigh Durham. I flew down there at 7:00 AM, turned around and flew back at 9:00 AM. I was in my office by 11:00 AM, and I was Gold. What does being Gold mean to me? I get to fly first class on every trip, without having to pay for it. It costs me $35 per flight. I get on the plane first with the old people and the children. I get 25% bonus miles whenever I fly anywhere. I have a special 800 number that I can call to get special services that are more personal and helpful than an ordinary passenger can get. What does my being Gold mean to American Airlines? It means that they have Arthur Hughes hooked. He will jump through hoops to arrange his schedule so that he always flies with them, or with an AA partner. I go to Orlando via Miami — it takes longer, but costs the same — because American does not have a direct flight to Orlando as many other airlines do. I have thought about this conversation many times since, and I think that the questioner was wrong. I value my American Airlines Gold Card more because I had to work for it. They set the bar up there pretty high, and let everyone know that they have to jump over it. When you have succeeded, you feel that you have accomplished something. If the good things of life are handed to you on a silver platter, you don’t appreciate them as much as if you have to work for them. American Airlines is not alone. There are many other companies that have not devalued their gold cards. The cards are tough to earn, and pay real dividends when you get them. The trouble with the companies that give Gold Cards to anyone, is that they have so many Gold Cardholders that they cannot afford to provide many benefits. The holders soon realize that the cards are of little value, and they don’t bother to carry them in their wallets or purses. There are some relationship-building principles at work here which apply to all facets of Database Marketing. A clerk who says “Have a nice day” to all her customers is being friendly, of course, but it doesn’t mean very much. It is a cheap gold card. A clerk who says, “How is your daughter doing at Wellesley?” knows how to build a relationship. She is weaving a cocoon that will bind that customer to her and to her company for years to come. This is a real Gold Card relationship. How can you get your employees to accumulate the information needed to build Gold Card relationships? Generous Benefits. When your customers have earned their Gold Status, make it really worth their while. How can you afford to do this? By assuring that your standards for membership are so high that only your very best customers qualify. You can then afford to be very generous with them. A wealth of information. Collect information about these Gold Card customers. Purchase history, age, income, family composition, preferences, lifestyle — anything that is important to understanding who these people are, and what they want. This information is tucked into your database. You then develop methods for producing and using this information in a way that is helpful to the customer. When I call the American Airlines Gold Desk to upgrade from Denver to Chicago, they say, “You and Mrs. Hughes want to upgrade all the way to Washington, don’t you?” What is behind this question? 1) they know that Helena and I are traveling together. 2) they know that we are going not just to Chicago, but to Washington. American Airlines (and other airlines) have built up a sophisticated computer system so that they can know these things. But you can and should do the same thing! It’s not just for airlines anymore. Database marketing is possible and available to everyone who is marketing to consumers or businesses and has a way of tracking purchases. Whether you are going to be successful in building lifetime relationships and increased sales depends on your ability to build and maintain a database, and to use it to provide helpful services to your best customers. When you think about it, every company that has a way of tracking customer purchases should have some sort of a gold card system. These are your best customers. You should treat them differently so that they feel special. You want to get them hooked on the wonderful service so that they feel that they can’t afford to switch. Even more important, you want to send a message to all of your second tier customers: those that have only 24,600 miles at the end of the year. “Just try a little harder, spend a little more, and you too can be Gold.” This is the real payoff for a gold card system: a motivator that encourages your second best customers to strive for best. What should you do if you don’t have a gold card system in place right now? There are several universal steps. Build a database. 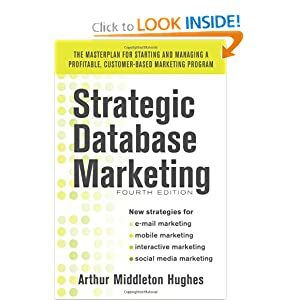 If you don’t have a customer marketing database, build one immediately. It should be one that tracks purchases, and permits the accumulation of points towards Gold. If you are thinking of building the database in-house, think again. If you out-source it with a company that has experience in building customer marketing databases for others, you will be able to build your database faster, and at lower cost than if you try to re-invent the wheel in-house. Code for RFM Code everyone in your database by Recency, Frequency, Monetary codes. The method for doing this is covered in some detail in The Complete Database Marketer 2nd Edition (Burr Ridge: Irwin Professional Books 1995) and in my previous book: Strategic Database Marketing (Chicago: Probus 1994). Both books are available from Marketing Tools. This method will make it easy to separate the gold customers from the other customers. You can segment your customer base into quintiles: best, next best, etc. Create a set of simple standards. Looking at your top quintile, find out how much they spend, and how they make purchase decisions. Every company will have a different system. If you are a car company, should you treat customers who have purchased two brand new cars from you in a 12 month period differently from those who have just bought one? Of course. How differently? What should you do? Each industry — particularly business to business situations — should be able to identify their top customers, and develop some simple rules for who qualifies for gold. Determine some valuable benefits which you can offer to these gold customers. Use Lifetime Value Analysis to decide how generous to make the benefits. Certainly the benefits should include a special Gold Card 800 number which only the gold customers can use, and through which your valuable benefits are dispensed. If you are unfamiliar with how to compute lifetime value, the books just referred to detail the methods. The basic idea is this: providing benefits to customers (if done correctly and to the correct customers) will increase retention and sales. These things increase lifetime value. At the same time, the benefits have a cost. These costs reduce lifetime value. Lifetime value analysis permits you to measure both benefits and costs to determine whether your Gold Card strategy is a winner or a loser. You absolutely must do this analysis before you spend any money on a Gold Card program. Let your customers know about the program. In particular, let the next to top tier, by personal communications, know how close they are to Gold, and what they have to do to qualify. This is where you will make the most money: by getting the second tier to make that extra effort. Once they have earned the status by hard work (or heavy spending) they will appreciate it more, and be among your most valuable customers. Don’t sell yourself short. Don’t listen to those who want to devalue your program, to cheapen it, to lower the bars, to let the riff-raff in. Don’t use your gold program to steal your competitor’s customers (as the questioner from my lecture suggested). By doing that, you are cheating your own loyal customers who have worked hard to get Gold. Keep your standards high, and make your Gold Customers proud to be Gold.